Today's "vegetable" (yes, those are quotes) recipe: One of those Midwestern classics, a zucchini chocolate, very chocolate-y and very orange-y thanks to both orange liqueur and fresh orange zest and juice. Virtuous only on the goodness scale. Parlor Tricks. That's what 99.99 percent of all dessert recipes with vegetables are. So now you think I'm gonna tell you that this Chocolate Zucchini Cake beats the odds, right? Nope. This is pure cake. The fact that there's zucchini in there matters not one whit in fact I suspect you could leave it out and not a soul would notice. I shake my head when I see you-know-the-type cookbooks talk about "sneaking" vegetables into kids foods. Like C.A.K.E. Still. This cake is so chocolate-y. And so orange-y. And extra-moist, even on Day Three. A keeper? You bet. But with full understanding, the zucchini is a parlor trick. RAISINS Soak raisins in orange liqueur for several hours. Drain raisins, but save the liqueur, you will need 1/3 cup. CAKE Heat oven to 350F/190C. 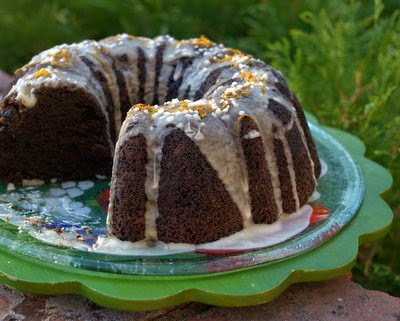 Spray a Bundt pan with baking spray, preferably Bakers Joy or another flour-and-oil spray. In a large bowl, mix butter and sugar with an electric mixer until light and fluffy. Add the eggs one at a time, mixing until well incorporated. With a spatula, turn in orange zest, zucchini, chocolate chips, raisins, 1/3 cup liqueur (from the raisins) and milk. DRY INGREDIENTS In a bowl, stir together all the dry ingredients. With a spatula, turn into the large bowl, stirring just until combined. BAKE Turn batter into prepared Bundt pan, level the top. Bake for 55 - 60 minutes until a toothpick inserted in the center comes out clean. Let cool for 20 minutes, then turn over onto a plate to finish cooling – it will likely release from the pan so be prepared! Cool completely. GLAZE & GARNISH In a bowl, mix the orange juice, orange liqueur, powdered sugar and about half the orange zest to form a thick drizzly glaze. Drizzle over the cake. Sprinkle with remaining orange zest and Swedish sugar. TO SERVE To serve right away, cut into slices. To serve in the next day or so, cover and refrigerate. Return to room temperature before serving. RAISINS Regular raisins would work, so would currants or even snips of dried apricot. GLAZE I think the glaze is prettier / fresher looking when done within an hour or two of serving so you might wait. You could still mix ahead of time. POWDERED SUGAR If your sugar is lumpy, be sure to work out any lumps before mixing with the liquid. I often have to just sift out the lumps. SWEDISH PEARL SUGAR I love this stuff! It's still sugary but more dramatic! Look for it in baking shops or here on Amazon. HEALTH NOTES So for those who watch the nutrition information, you'll see that the calories from the liqueur, raisins and chocolate add up quite quickly. One thing I've noticed, if you put a big piece of cake on a plate for someone, they'll eat it even if they don't really want it. So next time, I'll halve the recipe and use a half-size Bundt pan. It'll still serve the same number of people, it's weird that way, just with smaller but not-skimpy-feeling slices. Weird, I know. I would like to try this recipe for a family gathering in a couple of weeks. However because we have several recovering alcoholics, we are told not to use any alcohol/liqueur in anything me make (even though people think that it all burns off). So, what can be substituted for the orange liqueur (Cointreau) and still have the same orange intensity as you have made this? Also if using Hershey's Extra-Dark coco powder, will that make this cake taste more like a dark chocolate flavor, instead of using regular coco powder and it tasting like milk chocolate or devil's food chocolate cake? Thank you very much Alanna. Anonymous ~ You are so good to take care! I also cook for people that don’t drink alcohol so really pay attention to this stuff. Also, just FYI, the Cook’s Illustrated people once wrote about whether the alcohol cooks off or not -- and concluded it doesn’t, not even after a considerably long time. I don’t remember the details, just that alcohol should be avoided entirely, it doesn’t cook off. Anyway! To answer your question! At first I thought about suggesting orange extract but then wondered if it would have enough “oomph” and then, whoa, whether it might be alcohol-based too like vanilla. Nix that. But then? The answer is orange juice concentrated, the frozen stuff people use to make orange juice out of. We don’t drink juice but I keep a container in the freezer all the time as a flavor booster. I think you could get away with it full strength but if there’s any question, maybe use 2 tablespoons water to 6 tablespoons concentrate for the raisins, then a full tablespoon of full-strength concentrate for the glaze. I like this idea so much -- I think I’ll make it this way too, think it would be even extra orange-y! Good luck with your party! PS The Extra-Dark cocoa powder is a miracle product, everything tastes extra-chocolatey, yes, more like dark chocolate than milk chocolate. I use it ALL the time!